Dragon Lady Kitchen blog: Dragon Lady Lo-Mein, The Sequel: Extra Secret Revealed! Dragon Lady Lo-Mein, The Sequel: Extra Secret Revealed! Dragon Lady Lo-Mein made with fresh noodles. The dried noodle recipe is good, but the fresh noodle version is great -- a little lighter, and more flavorful. the fortune cookies with the custom-fortunes (see Feb. 12, 2010 posting). I’m sure “Tsue Chong” must be someone’s name, but to me, it means: “the noodle jail.” The store is dingy and non-descript, accented with some charming steel bars on the windows. (Now that’s a sign of some tasty noodles. Someone must have broken in once and stole a truckload of noodles!) Let’s just call it “shabby and not so chic.” The inside is about as charming as a newspaper shack, with battered and sparsely stocked shelves, and an unfinished concrete floor. But what you don’t see, is the full-scale production of noodles, fortune cookie and won-ton wrappers in the factory behind the small, dingy counter. This is where all the “Rose Brand” noodle products are made and distributed. Since you’re obviously not paying a mark-up for ambiance or fancy packaging here, the prices are incredibly reasonable. A 2 lb. package of fresh noodles costs under $2. They come vacuum sealed, so they freeze very well. So if you venture down there, stock up. Every so often, one of us will call around the family with a noodle search: “Do you have any noodles in your freezer? 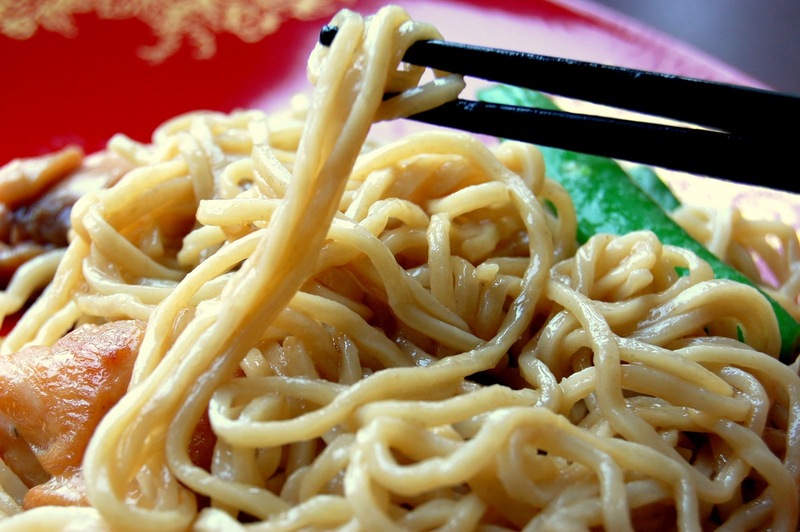 I want to make lo-mein.” Inevitably, someone will have an extra package in the freezer and will reluctantly cough it up. I plan to take a couple of my girlfriends on a little field trip to Tsue Chong in the next couple weeks. We’re going to have dim sum at the Jade Garden for lunch, then stock up on Dragon Lady fixin’s from the noodle jail and from my other favorite spot, the Hop Thanh supermarket. Let me know if you want to come!